Recently present a paper towel dispenser, but portable. 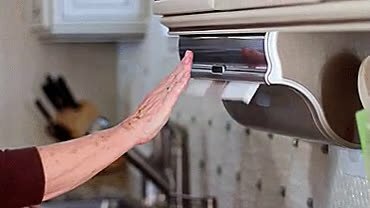 This one that I present today can be secured under one of your cabinets, when you need a towel, simply place your hand in front of the device and this dispenser will present you instantly a single sheet. To get more leaves, simply hold your hand in place. Rejoice Dear Hunter! You've followed our posting guidelines! Your hunt has been verified -- Yay!